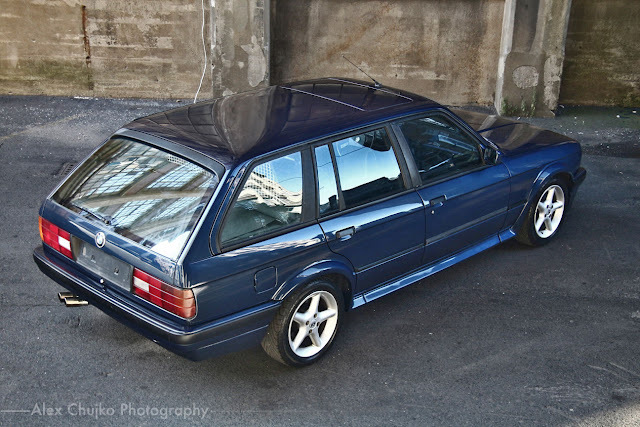 The E30 generation BMW 3-series was gobbled up by enthusiastic yuppies in the American market, but for some strange reason BMW didn't offer the wagon version here in the USA. Of course you can find them around, because over the years they have been imported by wagon fanatics and BMW lovers alike, but expect to pay a premium. 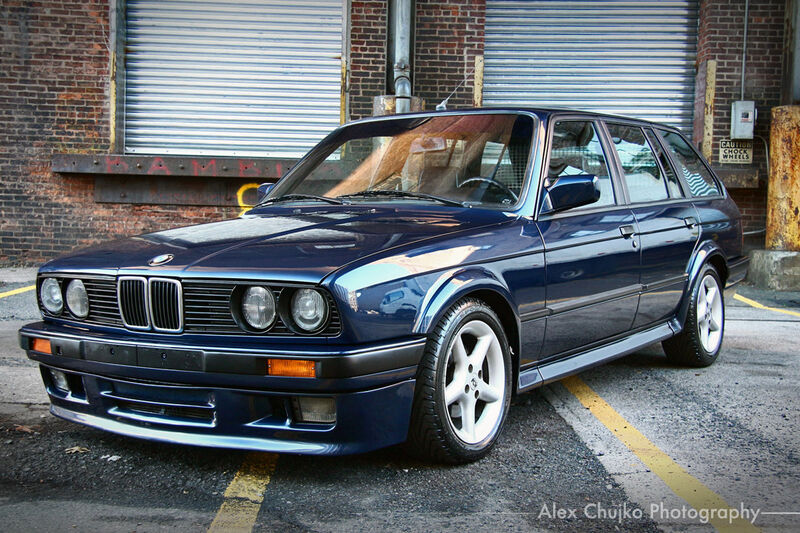 Find this 1988 BMW 325IX Touring bidding here on eBay for $13,100 reserve-not-met with 1 day to go, located in East Rutherford, NJ. Back in the day there was a perception that the US buyer wouldn't pay a premium for anything with a hatchback, small wagons included. Obviously this isn't the case in the market today, but I really wish it was whenever I'm behind a BMW 5-series GT, Honda Crosstour or Porsche Panamera. Anyway, this 3-series came from some left hand drive country in Europe (the seller doesn't specify) where it was ordered without AC from the factory...probably a northern climate. 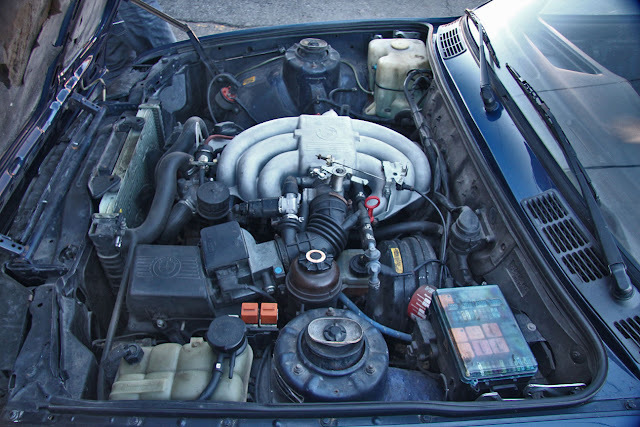 Under the hood is a M20B25 inline-6 that puts out 170 horsepower and 159 ft-lbs of torque which goes through a 5-speed manual gearbox and into all four wheels. Strangely enough the seller has including some really nicely staged interior and exterior pictures, but the engine bay looks filthier than Madonna's private video collection. Some unusual choices have been made here. I think the lower front valence is from an Eta (diving board bumper) version car. This car is a later short bumper (88+) car. Also strange that the dials have been 'upgraded' to have th silver rings and red needles. 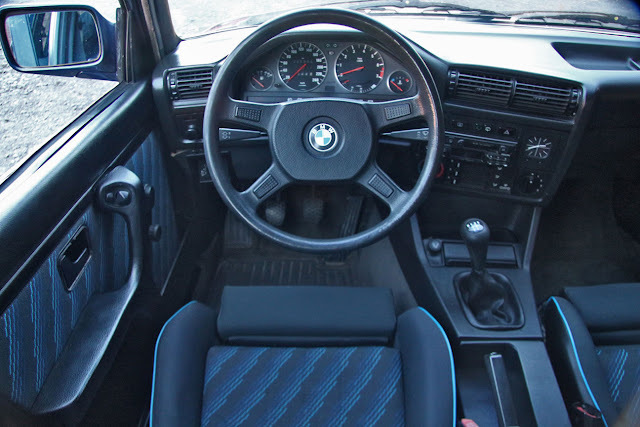 In E30s only the M3 had red needles, all the other cars had white speedo needles. Also you have a stock steering wheel when you could easily source the M-tech I or II on the web. With both 4wd and the extra weight of the wagon, I'm guessing this one is less spry than what most E30 enthusiasts, myself included, are used to. AWD but no heat? Not the ideal winter car. Actually, as much as I like these BMW wagons, I would prefer a regular RWD version. Lighter and nimbler, to my way of thinking. AWD and AC should be mutually exclusive. Anywhere where you'd need AC you shouldn't really need AC, Jersey is a place where I'd rather have AC than AWD. The blower on these cars is easy, it's a squirrel cage behind the panel on the passenger side fire wall. You can see the panel in the picture. For 13 large though it should really already be done. As I live in Winnipeg, which is just north of North Dakota we can get some extreme weather. Our summers get as high as 35C (95F) with humidity on top of that, and our winters get to -45C (-47F) with windchill on top of that. And we often deal with strong winds and snowdrifts. AWD and AC is definitely a necessity here as most people here can deal well with either the hot or the cold but not both. I for instance can handle the hot ok but not the cold and my dad is the opposite. If we were both in a vehicle we'd definitely prefer it in the moderate temperature zone. And AWD is a must given we can get heavy snowfalls and blowing winds and drifts.